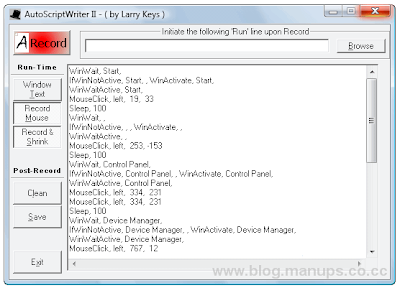 AutoHotkey is a script driven automation utility that enables you to automate almost any task on your PC by running applications or documents and/or sending keystrokes and mouse clicks. The program supports many advanced functionalities that allow you to create complex with flow control, math commands, variables and expressions, file functions, message boxes and much more. You can even create custom data entry forms, user interfaces, and menu bars. AutoHotkey does have an initial learning curve and requires you to learn a simple scripting language, however it includes very detailed documentation, as well as a Script Recorder, that can script simple task automatically by recording your mouse and keyword activities. Other features include support for AutoItv2 scripts, compile scripts to .EXE, keyboard remapping and more. * Change the volume, mute, and other settings of any soundcard. * Make any window transparent, always-on-top, or alter its shape. * Use a joystick or keyboard as a mouse. * Monitor your system. For example, close unwanted windows the moment they appear. * Retrieve and change the clipboard's contents, including file names copied from an Explorer window. * Disable or override Windows' own shortcut keys such as Win+E and Win+R. * Alleviate RSI with substitutes for Alt-Tab (using keys, mouse wheel, or buttons). * Customize the tray icon menu with your own icon, tooltip, menu items, and submenus. * Display dialog boxes, tooltips, balloon tips, and popup menus to interact with the user. * Perform scripted actions in response to system shutdown or logoff. * Detect how long the user has been idle. For example, run CPU intensive tasks only when the user is away. * Automate game actions by detecting images and pixel colors (this is intended for legitimate uses such as the alleviation of RSI). * Read, write, and parse text files more easily than in other languages. * Perform operation(s) upon a set of files that match a wildcard pattern. * Work with the registry and INI files.